The cats are still living primarily upstairs though Jae and Miko did come down on Sunday and watch the game with us. As long as everyone kept to their assigned seats they were fine, and by assigned seats, I mean the puppy stayed on my lap. Yes, on the sofa where no dogs are allowed. Today was our pediatric vet appointment. Ray wasn’t due for anything, but I just wanted him to get the once over and get used to the vet’s office. We saw the new vet today by request because I really was impressed by her when I took Miko in and even more so today. Kevin was afraid that this office might not see pit bull type dogs, but I was pretty sure they would. 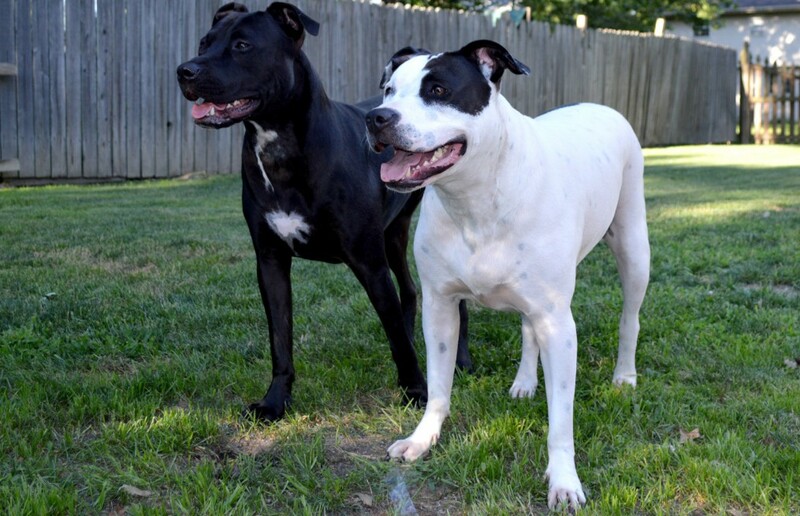 Well, not only that but our vet has a pit mix…and two cats! And she is expecting, so bully for her! Ray did pretty well, if I do say so myself. Our mission, beginning in a couple more weeks will be to socialize him as much as possible. I want to be good ambassadors for the breed and good advertisement for his rescue, Smiling K9’s Rescue. I never thought I would have a puppy and sometimes while correcting puppy bites and corralling a wound up tazmanian devil, I continue to question my sanity, but right now as I finish this post, a little snoring, wiggly pig is settled in my lap and I’m glad he’s here.